TELESCOPE PEAK, CALIFORNIA — Monsoon moisture pops thunderheads to the south, while drier air pushes down from the north. Somewhere above me those air masses are mixing. Forecast: indeterminate. 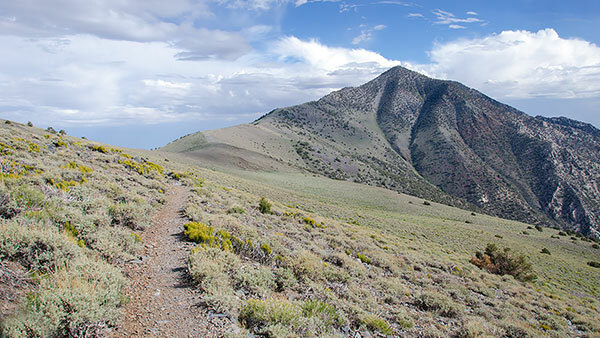 It's seven miles from the trailhead at Mahogany Flat to Telescope Peak's summit, and the majority traverse a broad, airy ridge offering not a hint of storm protection. It's up to the clouds as to whether my hiking partner Trevor and I will soon be basking atop one of California's most exotic summits—or playing a terrifying game of duck-and-run as lightning starts cracking. It seems appropriate that the threat of thunderstorms is at least lurking on the horizon. Telescope Peak is a desert summit, reminding me in many ways of the peaks of the desert Southwest. The highest point along the north-south Panamint Range, Telescope Peak's 11,043' summit is surrounded in all directions by desert: stark and austere. I understand that some people find the desert barren, but to my eyes deserts—and their mountains—are places of haunting beauty. Clouds are an inseparable part of that beauty, creating shadows and contrast, painting the landscape with light. And what a landscape it is: just a few miles to our east is Badwater, Death Valley, lowest point in North America. To the west is the equally-severe Panamint Valley. The Inyo Mountains and Owens Valley are a bit northwesterly, next-door neighbors. Beyond that, plainly visible on the horizon, are the looming summits of the High Sierra: Langley, Whitney, Russell, Williamson. In the opposite direction, occasional hints of the Southern ranges peak out from behind the shifting thunderheads: the San Gabriels, the San Gorgonios, the desert ranges farther east. There is not a single angle of view that isn't worth pausing to marvel at—hence the name of this remarkable mountain, said to be derived from the exclamation, "You could see no further with a Telescope..."